The recent release of The Lord of the Rings: Return of the King prompted one of my marathon reading sessions of all of Tolkien's Middle Earth works late last year. As always, when I finished Tolkien's works, I wondered if the modern man had any chance for heroic deeds, like the characters in Lord of the Rings. Is it possible for a man today to do great things, without carrying a sword and adventuring in ancient wild lands? 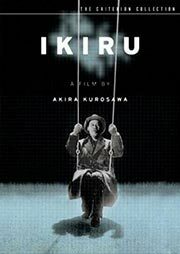 It's in that frame of mind that I began to watch Akira Kurosawa's Ikiru. The answer to my question, based on the film, is a resounding yes. Akira Kurosawa is, of course, Japan's best-known director. He's known, even in Japan, primarily for samurai pictures (chief among them Seven Samurai), and as one of the most influential directors in cinema; his spiritual students include George Lucas and Francis Ford Coppola. As I mentioned, he's best known for samurai movies, a genre in which he made many well known and classic films. However, Kurosawa's talent was not limited to period pictures, and he created many contemporary films set in Japan during the tumultuous 1940s and 50s. While I've seen some of these (Drunken Angel and Stray Dog), I had not seen one of his best, Ikiru ("To Live"). Ikiru is often mentioned with Seven Samurai as Kurosawa's best films. As I watched the film, I wondered how this emotional, but simple film could be mentioned in the same breath as the samurai epic, but by the film's end, I understood why it is considered great. Of course, a full plot description and analysis of the film is outside the scope of this review. Like all great art, Ikiru works on many different levels and imparts a subtle, but profound message to the viewer. It's a message that could fill a college dissertation, let alone a simple DVD review. In any case, the film follows Ken Watanabe (played by Takashi Shimura), a minor bureaucrat in Japan's burgeoning 1940s democracy. At best, Watanabe is a desk jockey with an unfulfilling job; he's a ghost of a man when he's at work. Towards the film's beginning, both Watanabe and the viewer find out that the aging bureaucrat has stomach cancer and that he only has six months to live. This life-changing discovery prompts Watanabe to examine his own life, and in a journey that can only be described as Buddhist, he realizes that everything he has based his life on is meaningless; his work, his family, everything he has is meaningless. Kurosawa strips everything away from the joyless Watanabe, so that he can be reborn. In the final months of his life, Watanabe finds a new passion and zeal in a public project, which gives his life meaning. My poor summary is no substitute for the film itself. Watanabe has to go through many trials to get to the place where he reaches his "enlightenment" (indeed, it's a Zen Buddhist satori moment for him; he reaches enlightenment in a sudden flash). Upon learning of his illness, Watanabe spends a night out in Tokyo with a second rate artist. Despite a night of fast times, Watanabe discovers that hedonism doesn't take away his cancer. After reaching this conclusion, he spends time with a girl from his office. Her free spirit seems to be exactly what he needs, but even that is not right. Kurosawa's great appeal during his life and afterwards is that he can make films that have these kinds of profound messages, but he does it in a way that even an average film viewer can enjoy. This isn't an experimental, avant-garde film that requires a Ph.D. in film to dissect; it's a tale of a humble man taking control of his life as it nears its end in order to reach a greater plane of existence before his death. The acting in Ikiru is excellent. As always, Shimura's acting is a treat. While watching this film, his genius is obvious; unlike Toshiro Mifune (a great actor, of course), Shimura can play a quiet husk of a man, and his range as an actor is spectacular. In Rashomon, he is a cowering wimp as the woodcutter. In Kurosawa's film after Ikiru, Seven Samurai, Shimura is the wise leader of men, a samurai Obi Wan Kenobi. In this film, he plays an old man at the end of his life's thread, with the choice to get busy living or get busy dying, to paraphrase The Shawshank Redemption. It's a role Mifune was simply unsuitable for. His acting is always powerful and direct; he's always an overwhelming man, but Watanabe is an underwhelming figure. Watanabe is the main focus of the film, but Kurosawa's other players make appearances, including many of the seven samurai, most notably Minoru Chiaki, the monk in Rashomon, and the good-natured Heiachi in Seven Samurai, here playing a greasy politician. Watanabe's free-spirited coworker, Toyo, is played by Miki Odagiri. While not a Kurosawa regular, she is a talented actress and a joy to watch during the film. Last year, shortly after Criterion put out Rashomon, I fired off an e-mail to them, congratulating them for a great release and inquiring about Ikiru. They told me then that Ikiru was scheduled for a January 2004 release and that good things were planned for it. They were right on both counts. Right on time, the special edition of Ikiru is indeed special. The two disc collection contains both a new transfer of the film and a commentary track by the author of The Warrior's Camera: The Cinema of Akira Kurosawa, Stephen Prince. While I don't think the commentary is quite as good as that of Seven Samurai, it's still very informative. The second disc has a number of cool features, including a 90 minute documentary about Akira Kurosawa, and a 40 minute documentary about the making of Ikiru. In special features, this disc does not disappoint. However, all this does come at a cost; the two-disc set has a MSRP of $40. In this day of bargain basement DVDs, it is a little pricey, but you pay for quality. Additionally, with a niche title such as this one, Criterion simply doesn't deal with the same production numbers as do distributors of recent American DVD releases, but they certainly make sure that the buyer gets a lot of extras for their money. I never know if classic films are an acquired taste, or whether they are something everyone would enjoy if they put aside their prejudices and just sat down and watched. So, as a reviewer, I just have to say that this is, indeed, a great film, and I believe it's worth your time and money. Yes, it's a black and white film about Japan in the 1940s. No, there are no samurai, no blood baths (although there are a few comical yakuza), or anything of that nature. Instead, we have a picture about a simple man fixing his life before death. And that, frankly, it's a beautiful thing.